For easy cleanup when glazing cookies, place waxed paper or paper towels under the cooling rack. For fuller cookies and less spread while baking, refrigerate dough between baking batches. 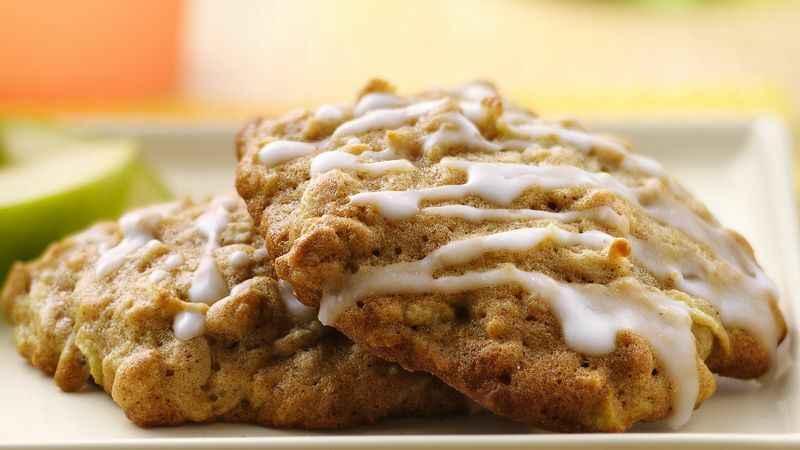 Oatmeal cookies are the perfect canvas for your favorite flavors. Chocolate chips or cranberries are always a tasty addition, but we especially love turning them into apple oatmeal cookies. This from-scratch version is perfectly gooey on the inside with a little extra crunch on the outside and the drizzle of apple-flavored glaze takes it over the top. Learn more about pulling off the irresistible gooey-crunchy texture that makes these cookies special, by reading up on Betty’s secrets for baking the absolute best cookie. Then get apple picking and start enjoying this cookie as your new favorite dessert (or breakfast or lunch—that’s a secret we’ll keep between us).